Tourism in Lusaka, Zambia's commercial and government center, thrives mostly due to its central location and well-connected airport, making it a gateway for exploring the country's numerous nature reserves and national parks. 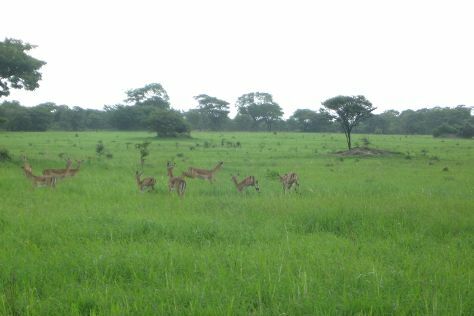 Kids will enjoy Chaminuka Game Reserve and Parays Game Farm Wildlife Sanctuary. Spend the 28th (Sat) exploring nature at Lower Zambezi National Park. There's lots more to do: head outdoors with The Lilayi Elephant Nursery, pause for some serene contemplation at Cathedral of The Holy Cross Lusaka, tour the pleasant surroundings at Kalimba Reptile Park, and see the interesting displays at Zambia National Museum. To see maps, reviews, traveler tips, and tourist information, go to the Lusaka online itinerary builder . Kota Kinabalu, Malaysia to Lusaka is an approximately 28-hour flight. The time zone difference when traveling from Kota Kinabalu to Lusaka is minus 6 hours. Finish your sightseeing early on the 3rd (Fri) to allow enough time to travel to Etosha National Park. For nature lovers, a trip to Etosha National Park seems like a dream: the vast salt desert houses hundreds of animal species, which roam the arid lands and gather near the many waterholes. Etosha National Park is known for parks. Your plan includes some of its best attractions: stroll through Etosha Pan and don't miss a visit to Okaukuejo waterhole. To see reviews, ratings, traveler tips, and tourist information, you can read our Etosha National Park day trip planner. Use the Route module to find suitable travel options from Lusaka to Etosha National Park. On the 7th (Tue), you're off tohome.